In addtion to creating comics and advertising concepts, Ron Ruelle also writes blog articles and Facebook posts for hobbyDB.com, a website about toys, collectibles and antiques. Here are some articles from the past year. (Caveat: there is a lot of specialized terminology and dialect that might be aimed at people who are enthusiasts of these particular topics, so don't worry if you don't understand some of it. Also, the client requires these articles to contain lots of links to their main site, so try not to get too distracted by all the blue text.) Enjoy! In an amazing combination of science, art, and promotion, a pair of Tesla Roadsters were shot into orbit last week by SpaceX. Elon Musk, head honcho of SpaceX and Tesla (as well as Solar City and Boring, a company whose flamethrowers are decidedly not boring) volunteered his red roadster for their mission... Read More! Superheroes have long been one of the most popular subjects for toys and collectibles, and why not? With a couple of action figures and a lot of imagination, anything is possible. Unfortunately, not everything that’s possible makes sense. Here are some of our, uhhh, favorite head-scratching superhero toys. If you have logical explanations for any of them, let us know in the comments!... Read More! Otto Kuhni, one of the great American artists of the last half century, passed away recently. If his name isn’t familiar, you surely knew his work. He was the artist who created the overall look of the new Hot Wheels brand in 1968 and continued to work for Mattel on and off until just a few years ago. The fiery orange-yellow-red blister cards instantly created an identity for the whole brand, and influenced diecast packaging ever since... Read more! When Hot Wheels and Johnny Lightning debuted with their wheels built for speed, Matchbox took notice. Not only were these new brands meant to go fast, but they offered some seriously crazy fantasy designs as well as models based on concept cars. All of which left Matchbox scrambling to compete. But how? They responded in phases.... Read more! Nineteen-sixty defined what a Colorado License Plate should look like... Jagged white mountain peaks with green sky and lettering became the template for most future plates... Read More! Be Thankful for Slot Cars This Week! We don't take slot car course design lightly in our house. There are no finer traditions for Thanksgiving than turkey with stuffing, binge watching football on TV all day, and trying to avoid politics around the dinner table. In our family, there’s one more important ritual: Setting up the slot car track in the basement. Read more! For almost half a century, Hot Wheels vehicles have fueled the imagination of kids with their cool, innovative, wild toy car designs. While many of them are pure fantasy creations, a lot are based on real cars. And in a few cases, they are based on regrettable, forgettable, even horrible cars... Read more! 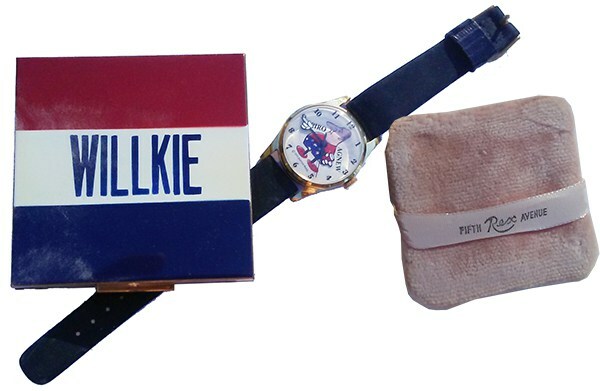 Wendell Willkie powder puff compact and Spiro Agnew watch. Over the course of U.S. history, presidential elections have resulted in a side industry that has created buttons, hats, posters, signs, bobbleheads, stickers… if it can promote a candidate, someone will make it. Some of them were created as giveaways, some as fundraisers, some as third party cash-ins. But however they came to be, election-related items can be an interesting batch... Read more! Oh yeaaaaaaaah! Who didn't want to pretend to be the Kool-Aid Man? Product placement in video games has become an annoying intrusion (except for driving games, in which case branded realism is more than welcome). But over the years, several companies have developed promotional video games starring their actual products, logos, and spokescharacters in acts of commercialism so blatant it’s almost cute... Read more! 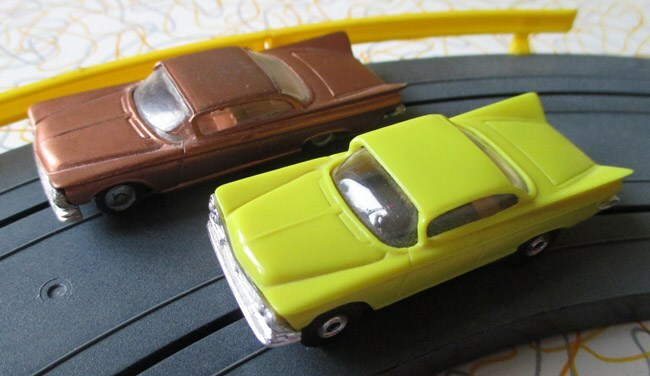 This yellow slot car has a strange, incorrect detail copied from the copper coupe above. Most diecast collectors would be upset to discover that a model car they just bought was an unauthorized knock-off of an original item. But in many cases, these copies are well documented and downright collectible on their own. And in rare instances, the alternate versions might even be worth more than the official models... Read more! Ron has a personal blog, the Ron Ruelle Blogcasting System, for his own random musings, too! Here are some highlights! "Make Hay While the Sun Shines?” No, You Do It, I’m Busy! I don’t need artisanal boutique hay, and you’re not going to buy it from me at the farmers market, either. It’s the same reason I don’t make my own soap. You know what happens when you make your own soap? You end up in a Fight Club, that’s what! Do you have any idea what goes on in a Fight Club? 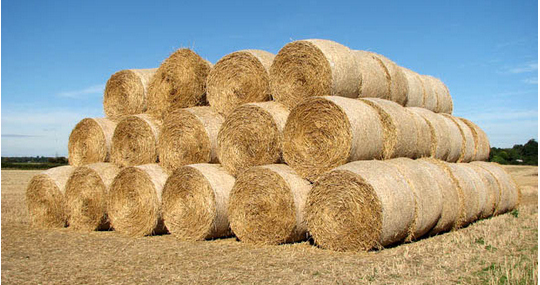 Do you have any idea how much capital investment you need to get into the haymaking business? Let’s take a look… Read more! ¡Punctuation and Grammar Need Work! I had an idea while I was writing late last night; the middle of the night is my most productive creative time; I’m sort of like Batman that way but without going all vigilante; so behold the Oxford semicolon! Cool, it’sn’t…? Read more! Which Chocolate Chip Cookie, Sausage Ball, or Rock Are You? A Quiz! A man leaves New York by train at 7:00 am local time. How long until he is in Philadelphia? Time is irrelevant to a rock. The train is in Europe, so he needs to go to an airport first. He has been in Philly the entire time. Read more! 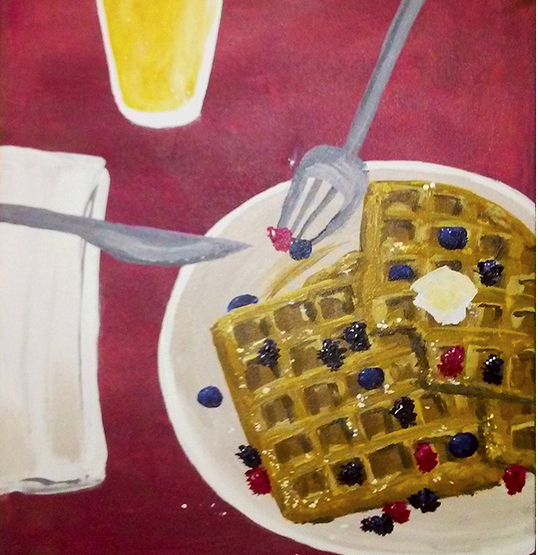 An exciting new art retrospective has opened at the Museum of Ron’s Basement, called “The Acrylic Art School Images of Ron Ruelle.” Today we will focus in depth on his signature piece from the “Painting and Mimosas” phase of his career, Waffles and Beer... Read more! 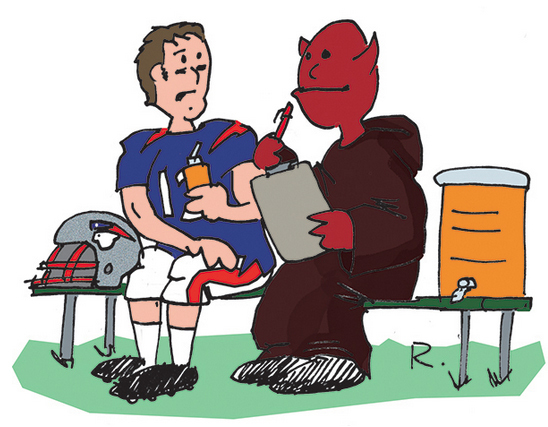 Scene: Patriots training camp, 2001: A young Tom Brady sits on the bench admiring the starter, Drew Bledsoe practicing. A shadowy, menacing figure sits next to him.. Read more!